Wow. It's been a while since I did an overview of what media I've been consuming. Previously, I'd only covered books and game materials, but I've also been watching a bit more television. A few shows have both caught and held my interest - and they're shows that I think more people would enjoy. I've been reading a ton of Ian Rankin novels. I'm more than half-way through the Inspector Rebus series, and am absolutely loving it. I've read more mysteries in the last two months than I have in the last decade. I think you could very easily replicate the feel of these books using Gumshoe (which you'll see a lot in this post) or FATE (which you will also see a lot of). I'm also reading through Castles & Crusades, which a friend sent to me as a gift. It's ... it's not bad. If you've played d20, you'll feel right at home in this one. It's not amazing mechanically, but it's solid and functional - and I'm really enjoying the sourcebooks. Enough that I backed one of them on Kickstarter. And I'm continuing to read through Legend of the Five Rings. The Fourth Edition books are a mixed bag. There is a ton of good stuff in there - they've done their best to make the books era-agnostic. There are things in there that are useful for games set in the era I'm most familiar with (pre-Coup, for those of you who were curious), but there are a lot of pages devoted to the post-Toturi era and have things that don't fit all that well into my vision of Rokugan (like the Spider Clan). But the two Imperial Histories books are remarkable. Especially the second one, which is a sort of What If? for Rokugan. There are really only four television shows I watch regularly. I tried to watch a few others, but they just didn't click. The Blacklist is an NBC network show that is the single most Night's Black Agents show I've seen in a very long time. It reminds me a bit of Silence of the Lambs - there is a supercriminal working with the FBI to catch other supercriminals. The characters in the show seem to get all the clues - the struggle is interpreting them. The show can get a bit dark at times, but it's a ton of fun. You could probably also replicate it using Cortex Plus, but it's more gritty than any of the Cortex Plus interpretations I've seen so far. Person of Interest is a show I've been watching since the beginning. When it started, it was a little rough, but as it's continued, it's gotten both better and more intricate. Originally, there were two lead characters with a handful of supporting characters. Now there are more leads, and it's more gameable. I think that the Leverage implementation of Cortex Plus would be a good one for this show. Arrow is ... it's a guilty pleasure. The first season was bad. Really bad. But it had a great deal of potential. This second season, it's been less a guilty pleasure and more of an actual pleasure. Because somehow it got good when I wasn't looking. It's a bit more action-oriented than Smallville was, but it fills that same niche, scratches that same itch, and could be easily played using the same system. Intelligence failed to hold my interest. It was an interesting premise - it was essentially a Chuck that took itself seriously. But they wrapped up the only interesting story thread from the pilot in the second episode. By the third episode, it was squarely in my "not interested" category - it went nowhere new and was essentially a tired retread without all that charm. Our twice-monthly Dresden Files game is nearing its end. They are apparently starting a Pathfinder game to replace it. I ... I don't know. I love the group. The players are among my favorite people. But I don't like Pathfinder. The more I read it, the more it clunks for me. To the point where I don't know if I'm willing to play it anymore. Regardless of the group. Our 13th Age game, meanwhile, is slow-moving due to scheduling. The GM's been laid up with a back injury for a bit. Our last session was the best so far. And I'm still really loving the system. I can't wait for the next few supplements, because they are going to probably work their way into the game. +Wade Rockett is good like that. Our Dungeons & Dragons game (4e) has been on hiatus. The DM has been in process of moving from California back to Washington - and it's nice to have him back. It means we can probably do some of our gaming face-to-face instead of online. I've started my GenCon prep. Yes, already. I've copied a whole bunch of rulebooks to my tablet and am studying and reading during my day job's breaks and lunches. Even for games I don't actually own, but that will be in the booth. Five months to go - and I intend to be ready. I know it's not a new trend, but Board Game Cafes seem to be popping up more and more. 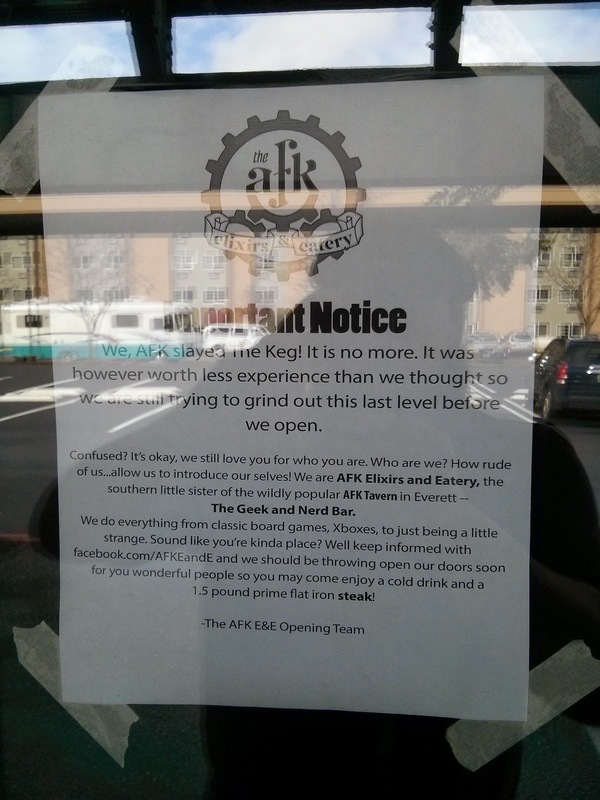 Locally, we have the AFK Tavern and Cafe Mox. And the AFK Tavern has expanded to a second location, to be called "AFK Elixirs and Eatery." We also have the Ray Gun Lounge, but I don't know if they're still serving food or not. The Geek and Nerd Bar. 1.5 pound prime flat iron steak! The "Slayed the Keg" line is because the location used to be a Keg restaurant. They actually posted a postmortem of their first day of beta here. What's not posted anywhere I could find is what their normal hours are going to be. So I still don't know if I'll be able to head there for lunch from time to time. During their beta, they are open from 6pm until 2am. I wrote about my first experience at the AFK here and my second visit here. I've been there a handful of times since. Their service is consistently slow when they get busy, but the food continued to be tasty. I haven't actually written about the Cafe Mox, yet - I should remedy that at some point. My thumbnail is "Similar to AFK with a different menu and fewer tables." Gaming cafes are inherently a weird idea. I know they're around. I know they're successful. Last year at GenCon, we drove past one that was planning to open soon. I have friends in Montreal who run one. How do restaurants make money? The simplistic answer is "they sell food." But there's more to it than that. You need to "turn tables" to make enough money to stick around. In plain English, you need people to eat and then leave so you can get more people at that table to order more food. If I go to a restaurant and sit for six hours nursing a small soda while wait times stack up, then I'm not making you money. I'm costing you money. So that table in the corner playing Diplomacy? They're not going to make you much money unless you impose a minimum food/drink order. And, even then, they'll probably make you less money than if they left and gave you a new set of hungry people - because they'll eat slowly and scrape by at the minimum until they're done. In other words: You'll have all of the concerns that a "normal" restaurant will have. That is, you need to decide on the quality of your food and its portion size against the prices you charge for your food. You need to make sure you're charging enough to cover your rent, utilities, food, wages, and other supplies. And - speaking of wages - you need to have enough staff that customers don't suffer through long waits. Oddly, this means that the better your staff, the less staff you need. Because a good server can handle more tables than a rookie can. But if you have too few staff, then your wait times will surge - and you need to be prepared for the occasional unexpected surge. Add to all of this the fact that a game cafe needs to have games, and games aren't free. As an added bonus, you can't let your library stagnate, either. So there's additional up-front expense and additional ongoing expense. Some publishers will send you free copies of games if you ask nicely, because having your games being played is good publicity. Some game stores will work with you, too. But you still need to have games. And - as we all know - games + food = need for game replacement. So you not only need games, you need to be able to replace them when they have soda spilled on them. Of course, if you have a "you soaked it, you bought it" policy in place, you're off to a good start. The "games" part of the equation means that - realistically - you need to make more money than a comparable restaurant does. Not a ton more, mind you, but enough that it's something to keep in mind. You know - in case you were thinking about opening a cafe of your own. I get occasional questions from folks about how it is I managed to get a regular group for gaming - and it occurs to me that it really shouldn't be that complicated. And realistically, it isn't. Games that people want to play. Time in which to play the games. People to play the games with. A place to gather in order to play the games. You need all of these, and none of them is less important than any of the others. An argument can be made that you don't need to be the owner of the games, but you still need to have the games in order to play them. And if you are relying on someone else to bring the games, then there is a potential weak link in your chain. Once you have started the group, you need to extend these four things. Because these four things are the foundation of a gaming group - but they're also the components needed to sustain the group, once you get it started. The first thing you need to extend is the time. By "extend" in this case, I don't mean "run it longer." What I mean is "project it forward down the calendar." Choose a time and, as the host, make that time sacrosanct. For me, it's Wednesdays. I have Game Night on Wednesdays, and I do not ever schedule anything against it. Even though I'm not technically the host these days (as Game Night is held at the Game Store), I still feel a sense of responsibility to the group. And I will not counter-program against it, because Game Night is my priority. Even before we moved the gathering to the game store, my friends knew not to invite me to Wednesday events, because I wouldn't go. And that hasn't changed. Wednesday Night is Game Night. Period. To extend the place to play, just make sure that your available place doesn't go away. If it's in your home, don't cover your table with stuff. Ideally, you'll eventually want multiple play surfaces. If it's being held in a game store or a library, make sure you have reserved the room or table(s). It's not actually difficult. If your location costs you money, then it's up to you if you want to collect from the group or just shoulder that burden yourself. Just don't spring it on folks - give them advance notice. And, of course, as the group grows, you'll need more tables and more space. It's up to you how you extend the people category. You can use social media to invite people over. I've seen groups use Craigslist, Boardgamegeek, Meetup, Facebook, Twitter, LiveJournal, and Google Plus. And there are more options out there than that, too. You can also tell people who are already attending that they can invite others. The reason you need to invite people is so that you can still play even when people can't make it. To give you an idea: at the end of my first year of hosting, we'd had a total attendance of more than thirty people through - but our largest night had been seven people (including me). Of course, you also need to be prepared for when more than four people show up. Because if all you have is Settlers of Catan, you'll have an issue pretty quickly. This is why you need to extend the number of games you have access to. And, once you get into the six to eight people range regularly, you'll need to start splitting into multiple simultaneous games. This means that you need to own (or at least have access to) multiple games. Do your homework - read reviews. Find a reviewer that you trust. For example, I don't always agree with Tom Vasel, but he always gives me enough information that my decision is informed. When buying games, pay attention to the number of players they support - it's a good idea to have one or two good two-player games, but you should focus on games that support between three and five players (with one or two larger games). Don't extend these things quickly. Start by clearing your schedule, and then gradually extend everything else. The rule of thumb I see is that your number of games should be roughly one game per four regulars, with a minimum of two different games. So a group of twelve who usually has six members should have a minimum of three games to choose from. Don't worry if you don't see explosive growth. In fact, slow growth is ideal - it gives you (and the group) the opportunity to get to know one another and your gaming preferences. My group is now more than a decade in. These days, we've had several hundred people through at one time or another. And we pull (on average) about 20 folks per week. Generally, there are four or five different games going, and very rarely are people standing around looking for a game to play. It was the result of slow growth, following the same process I outlined here. I'd like to believe I'm a part of the best group in the country. But - realistically - the best group you'll ever be a part of is the group you grow yourself. Just a short post, today, because I had a longer one on Monday, which sucked all the words right out of me. Well, sorta. I have more words, but they need a bit of polish, still. In the meantime, remember what I said about naming names a few weeks ago and how I need to be better at giving credit where it's due? This post is all about thanking Carol for making sure Stephanie and I have a room at GenCon, because we don't stay in the same hotel (and rooms) as the rest of the team does. It means that (among other things), Steph and I aren't subject to the whims of traffic - we just walk to the convention center. This, in turn, guarantees that there is a presence in the booth when it opens. It also allows us to stay in the convention center much later than the rest of the team, playing (and teaching) games in the open game areas. In the past, Asmodee has just forwarded us their housing code and asked us to make our own reservations, for which we are partially reimbursed. This year, they took care of making all of the arrangements, and I suspect Steph and I will be reimbursing them. But we'll see. Either way, housing for the general public opened a few weeks ago - and sold out in a few hours, amidst a number of widely-reported issues with the interface. I started to stress at that point, not remembering that there was a separate pool of housing for exhibitors. When vendor housing was scheduled to go live, they actually delayed it by two weeks to work out the issues they'd had with public housing. So I had two extra weeks in which to stress. Then, on Friday, Carol e-mailed me, asking which hotel we'd prefer. Now, last year, we'd had a scare whereby Steph and I hadn't initially been able to get the Convention rate for two of the nights we needed to be there. Asmodee stepped up and reserved rooms outside of the convention block for us, just in case. It didn't end up being necessary - enough spaces opened up in the waitlist that we were able to get our stay as-needed, and Asmodee was able to cancel their reservation without penalty. So I initially figured Carol's e-mail was a backup thing. In case Steph and I were short days again. But no - she took care of making our reservation for us this morning. And it's a good thing, too, because exhibitor housing filled up as quickly as the general public's housing did. Now, I don't think Carol isn't the only person there doing administrative work like this - but she's the one who keeps me in the loop about it. So thank you, Carol. And please pass the thanks on to anyone else who deserves it - Ruby, Claire, Christophe, Stefan, Jules, and anyone else whose name I've missed, because I know I've missed a few because of how terrible I am with names (I can see their faces - I just can't remember their names). And I'll see you in just over five months!